Today we have come up with a very interesting comparison between two similar microphones, Razer Seiren, and Blue Yeti. Basically, both are condenser mics with four different polar patterns such as cardioid, bidirectional, omnidirectional and stereo. In the following content, we will through some light on the features of the above mentioned two condenser mics and discuss the similarities and differences between the two. This mic is a perfect selection for recording at home or studio. Thanks to its aluminum base stabilizer, it does not require an additional mic stand to stay still on the table. Whether you are a professional studio artist, musician, just simple game streamer or youtube performer, this mic is designed to meet and fulfill requirements as well as the expectations of all. High-level recording clarity and superior sound quality are all that what your audience will get. Razer Seiren is known for its unmatched performance. Blue Yeti efficiently uses Blue microphone’s proprietary tri-capsule technology, in order to create studio-like sound quality directly on your computer. Your listeners will get nothing less than pristine and high clarity sound. The icing on the cake is four different pattern setting that let you record vocals, instrumental music, podcast and interviews with a single microphone, which would have otherwise required multiple microphones to record. A simple control such as headphone volume, pattern selection, and instant mute along with microphone gain, this mic is not only easy to use but you can also create exceptional output in real time. Though both the mics are almost similar in size and dimensions, still Blue Yeti is slightly heavier than Razer Seiren. On one hand, consumers find Razer Seiren to be sturdy, stable and presentable; on the other hand, Blue Yeti has created exceptional impression due to its easy setup, versatility, sturdiness and substantial weight. When talked about sturdiness, Razer Seiren was found to be more fragile and always required external power when compared to Blue Yeti which is sturdier and have some weight in it. The first and foremost similarity between the two mics is that both are very sensitive and need a pop filter in order to eliminate the disturbance in the background and produce crisp and clear sound quality. Another similarity between the two as discussed earlier is their weight and dimensions. Both are large and heavy mics, suitable for use by highly professional studio artists as well as the musicians. They offer good stability and sturdiness to the user. Though Razer Seiren has an aluminum base offering stability to the mic, both the mics can be mounted on a separate mic stand as per the requirement and convenience of the user, place of use and purpose of use. The first and foremost difference between Razer Seiren and Blue Yeti is the difference in their USB plug-in. Blue Yeti has standard USB to offer, whereas Razer Seiren comes with micro USB port suiting to demands of modern gadgets and plugins. 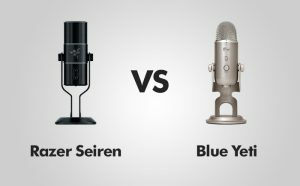 When we talk about aesthetics Seiren again gets a brownie point over Blue Yeti. Blue Yeti has a rounded shape which makes it look outdated. On the contrary, Razer Seiren has square shape giving it modern and contemporary look as well. Another difference is about the cables. Blue Yeti has traditional cable sensitive to breakage on accidental pulling, whereas Razer Seiren has braided cable making it all the more strong and durable. When talked about simplicity or ease of use, Razer Seiren again gets an edge over Blue Yeti. Razer Seiren has screened in the front which not only shows the pattern and all the other settings you are using at present but also makes the selection of pattern and settings simpler. On the other hand, Blue Yeti has the same screen at the back making its usage a little inconvenient when compared to Razer Seiren. When looked at the sound quality of the two, they are very similar in more than one ways, but an expert will be able to find the subtle differences between the two. Blue Yeti produces sound which is much more analytical and articulate in nature, whereas Razer Seiren is warmer and boomer. You can have higher bass in Razer Seiren as compared to Blue Yeti. When we come to cost, there is no denial of the fact that Razer Seiren is expensive as compared to Blue Yeti. No doubt it is easy to use, but given the fact that sound quality produced by the two is almost similar, there is no point in asking for a higher Apart from that since razer, Seiren has more emphasis on bass rather than articulation, professionals prefer Blue Yeti over Razer Seiren. In addition to that, it is also very important to note that Razer Seiren is fragile in more than one ways and the sturdiness to use the mic for long-term is offered by Blue Yeti. And there is no denial to it. In the end, I would like to conclude by saying that Razer Seiren is a good USB condenser microphone performing well in almost every voiceover situation. It is mainly marketed as a gaming microphone and it is living up to the expectations of the user. On the other hand, Blue Yeti is capable of giving cut throat competition to Razer Seiren in the given category. It is a USB condenser microphone with a much more affordable price.